Wearing - Blouse - Asos. Pinafore - New Look. 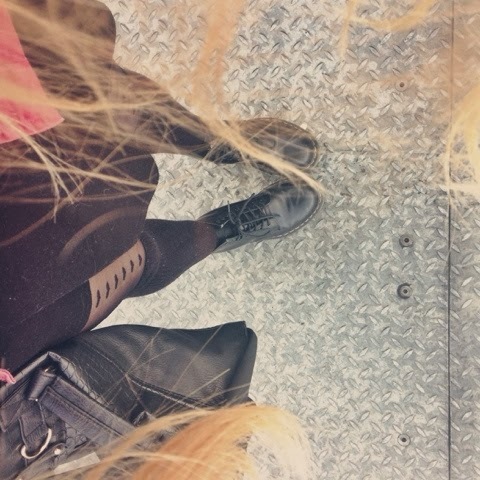 Tights - Primark. Socks - Forever 21. Boots - Office. So yesterday I travelled to London to meet with my 'bloggy friend' Jordan. I've met Jordan a couple of times now at different events and we wanted to have a girly day shopping along Oxford Street. We started off trying to navigate ourselves around Topshop, there were so many amazing clothes that it is so easy to get lost in their. It almost feels like getting lost in a jungle! I've got a personal shopping experience (my Christmas present!) coming up so I was hesitant to buy anything and thought I should wait for that. Although I did find this lovely black and white striped baggy crop top with I was very tempted to purchase. Jordan got some gorgeous 'mom' jeans. I really like the look of those jeans and think Jordan will pull them off amazingly, however I think they would look a bit of a fail on me! On our way out of Topshop we saw the 'Topshop goes virtual catwalk.' I had read about this and didn't realise it was open for people to try out for a few days. Basically we sat in the shop window, put on these ski glasses type things and headphones. You then felt like you were actually at the Topshop Unique fashion show AW/14 you could see the models walk straight in front of you, see different scenes backstage and hear the music playing. It was a great experience and something that was so random but cool to do. We then met up with Islay and Carissa for lunch which was lovely. It was great to be able to have a quick catch-up and laugh with them before they went off to different events. Jordan and I then explored some more shops and spent a while in Boots. I wanted to make the most of her 'beauty vlogger' expertise and ended up purchasing a new eyeliner (Loreal super liner) and 'Pillow Talk' Topshop Lipstick. It was a lovely day catching up with Jordan whilst sharing a few laughs. One of the great things about blogging that I really love is meeting and making new friends; We've even got a plan to have a road trip once I can drive! I'm going to ramble on a bit about this outfit just to make this post even longer...! I have wanted a cream/white blouse for absolutely ages. It just seems like such a timeless piece that can be styled in so many different ways. So when I saw it on Asos in stock and in my size I immediately ordered it. The detailing around the collar is just so whimsical. I always go a bit 'all-out' with my outfit when I go to London for the day so I thought I would pair my patterned tights with high socks just to add a bit of a girly touch. I really loved the vibe this outfit created and think I'll be wearing this blouse lots more. Anyway, I'll stop rambling now and will be back with possibly a wishlist soon! I really love this outfit! The pictures you take are lovely too. in love with your outfit especially that blouse ahh so pretty!